The dance studio was recognized as the Best Zumba Studio of 2016. 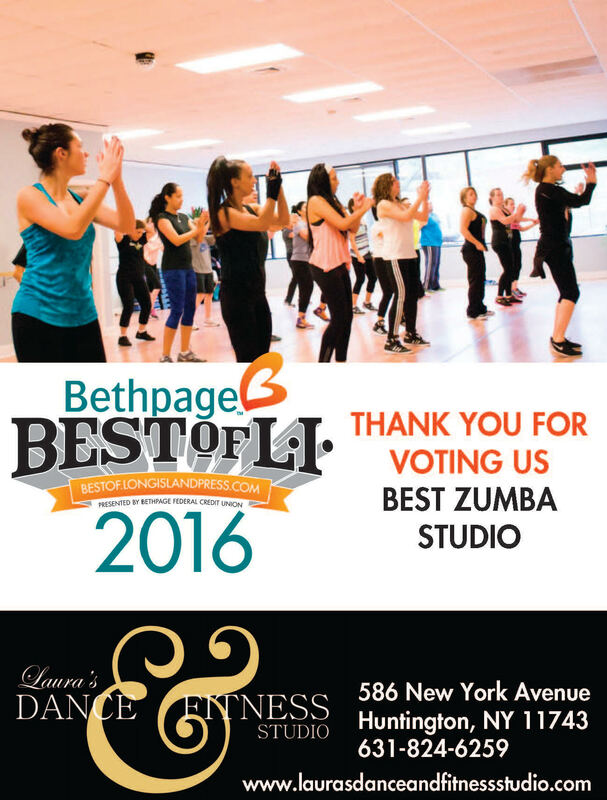 Laura’s Dance and Fitness Studio is proud to announce it has been awarded the Bethpage Best of Long Island Award for Best Zumba Studio of 2016. Winners of the awards were nominated and voted for online by the citizens of Long Island, New York. Founded in 2014, Laura’s Dance and Fitness Studio is a boutique studio that serves dance and fitness beginners to seasoned enthusiasts, and an age range from toddlers to adults. The studio offers a variety of children’s dance classes including pre-school, tap, ballet, jazz, hip hop, lyrical, pointe and acrobatics as well as fitness classes in Zumba, Piloxing, Cize, Tabata, Circuit Training, Pound, etc. They also offer personal training and host birthday parties. The Bethpage Best of Long Island awards are sponsored by the Bethpage Federal Credit Union and have been recognizing Long Island businesses for the past 10 years. Businesses are nominated in categories that include arts and entertainment, clothing, food and drink and weddings. Laura’s Dance and Fitness Studio was recognized in the health and wellness category. Laura Marciano graduated from Adelphi University with honors and is a prolific dancer. Over the years she has received many prestigious awards such as the New York State Theater Education Association Award of Excellence for choreography in musical theater. The studio is located at 586 New York Avenue in Huntington right off of Main Street. For more information about dance or fitness classes please call 631-824-6259 or email laurasdanceandfitnessstudio@gmail.com or visit us on the web at www.laurasdanceandfitnessstudio.com.